Today I got a package from Essie with some of their newest shades from Navigate Her Collection (info, promo photos & prices) and Resort Collection (info, promo photos & prices). 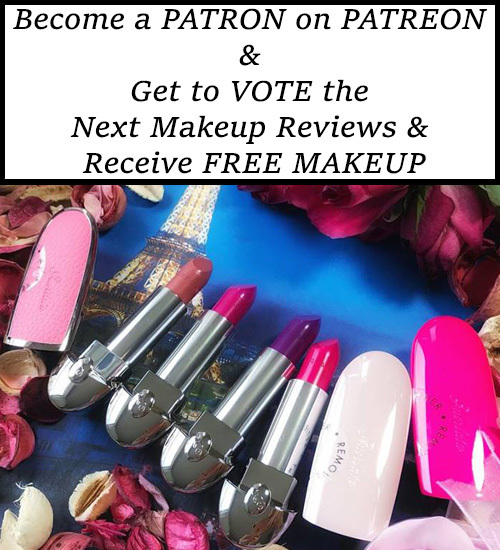 I’ve already posted official information regarding these 2 nail polish collections and if you’ve missed it you can click on the link and have a quick look. Navigate Her Collection is already available international at beauty salons and online @essie.com and includes 6 shades ($8.00 each). One of the good news is that we are having this collection also available in Romania starting 1 March 2012. 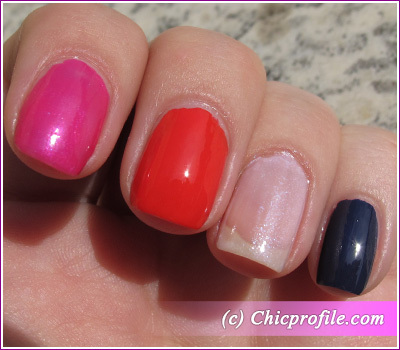 You can order the new colors from Navigate Her Collection online @fendissimadistribution.ro (44.50 Lei). Fendissima Distribution is the official representative of Essie nail polish in Romania so they will have listed all of Essie new products on their website. They were so kind to send me these nail polishes so I’m making this short preview to show you swatches and I will post reviews of each nail polish in the upcoming days. I got from this collection only two shades that I like most: Ole Caliente and Tour de Finance. Resort Collection will also be launched internationally in March 2012 and in Romania on 15 March 2012 (@fendissimadistribution.ro). 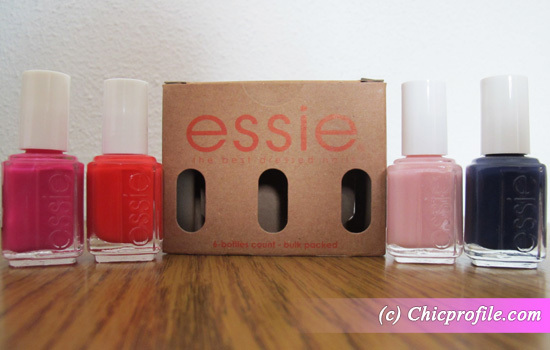 As I said before is a mini collections which includes 4 nail polishes each retailing for the price of $8.00 (44.50 Lei). From Resort Collection I chose No More Film and Pink a Boo shades. Each bottle contains 13,5 ml of product. Keep reading and check out the swatches. Here are the swatches! I took the photo in bright day light, no blitz. Before applying the polish I used a coat and I recommend you do the same especially for No More Film which is a dark color. I haven’t used a top coat because I just want to see how shiny the color is and you can see they have a really shiny finish. Tour de Finance – fuchsia with shimmer. It looks like a deep fuchsia but shimmery particles are almost unnoticeable. It’s a strong bright color, opaque and with a creamy texture. One layer of color was enough to get this color but for the review I will definitely apply 2 coats. It has a thick texture, but not to think, it can be applied easily but I’m guessing when I’ll reach the half of the bottle I will need a nail polish thinner solution. Ole Caliente is a red orange with pink undertone. It’s a bright and opaque color without shimmer. It has a creamy texture and also one layer of polish was enough this time. I will give you my opinion after a few days while I will test this color on my nails with and without top coat. Pink a Boo – flirty micro glitter sheer. It’s definitely the lightest color of Resort Collection Spring 2012 and it’s a very transparent light pink with blue undertones and shimmery finish. The small glitter particles gives the polish more like a pearl-pink effect. For this color I’ve applied 2 coats but it still looks very sheer on nails. I would honestly be using this one for a french manicure or a bridal manicure. No More Film – seductive deep violet creme. This one is definitely my favorite polish from Resort Collection. You know me always in love with pink or dark shades. No More Film looks more like a dark blue in natural light, but if you take a closer look in bright or sunny light you can definitely pick up its violet undertones. It a creamy polish, very opaque and it can be applied very easy without leaving strokes. All 4 nail polishes had a decent time of drying, I would probably say Pink a Boo dried faster while the others took just a lil’ bit longer but still, it was a decent 4-5 minutes. I can’t wait to wear these on my nails, but the reviews will take me a little longer because I want to test all the possibility. 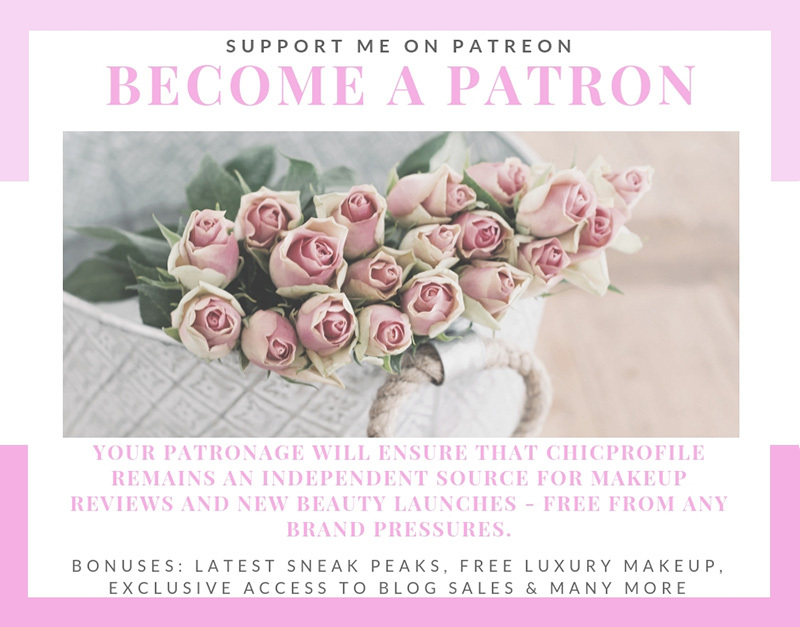 If you read any of my nail polish reviews you know I like to take my time and test the color with and without top coat to see its long lasting results. I’m not looking only for a nice shade on my nails but also for one that will not chip off after 2-3 days. 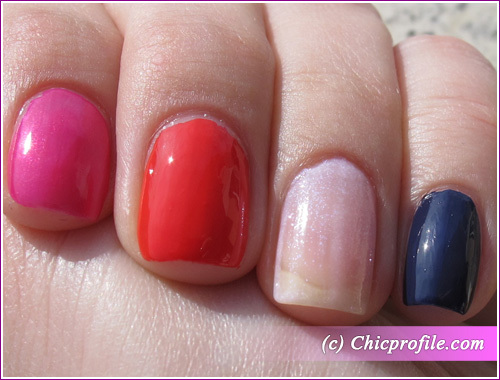 Which nail color do you like? 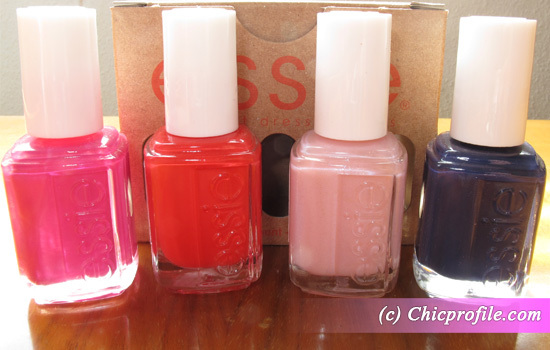 Are you planning on buying anything from Essie Spring 2012 Nail Polish Collections?